I’ve already written about horsetail, sometimes called ‘England’s Aloe Vera’, due to its incredible healing properties. This month I want to look at the real Aloe Vera, or similar species that many of you will have growing in pots on your window sill. Aloes are succulents. This means they have fat, fleshy leaves designed to store large amounts of fluid in arid environments. It is the large amount of water stored within the cells of the leaves that gives us the sticky gel that is used for so many healing and beauty processes. The photos in the article are of my own plants; amazingly, they all stem from (pardon the pun) one tiny, baby plant I was given by an old friend many years ago. Aloes quite happily reproduce by splitting and ‘having babies’; tiny offshoots that become new plants in their own right. From one, miniscule plant in a 3 inch pot, I now have 3 large plants that are each a foot in height and width, and about 8 smaller ones. Not including ones that have been given away as gifts! So realistically, my descendants may have Aloe plants that all have their roots right here, right now with me. A truly immortal plant. 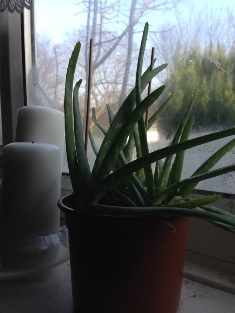 I have two, beautiful aloe plants on the tiny kitchen windowsill in my house. They are quite happy with the small amount of light they get through the small pane, and they are right next to the sink so I never forget to water them once the soil dries out. Why do I keep them where I cook? Because I am clumsy, and I frequently burn myself while performing my culinary experiments. Having the Aloe to hand is like having access to your own little burns unit! I break a tip off a leaf, revealing the squidgy, unctuous substance inside. The leaf is gently squeezed to encourage the liquid to come out. This is then spread on the affected area. The gel is remarkably soothing. Even in summer it possesses a cooling quality that takes the sting of the burn away instantly. But normally, when I’m in the Kitchen Garden, I’m talking about food. And Aloe is not so great in that area. You can drink a juice made from the gel and many companies (I won’t name and shame) have made grandiose claims about the health benefits including that it helps with weight loss, immune function and the all-encompassing ‘detox’. There is, however, no scientific evidence to back these claims up. Also, the juice/gel may be toxic if eaten in very high quantities, although this has only been confirmed in rats, not humans. Toxicity and health claims aside, it really doesn’t taste very nice (yep, I tried it!) so for me, the best use for it in the kitchen is to soothe my sore fingers when I singe them. As well as being a great topical remedy for burns, Aloe gives the same soothing benefits for sunburn, dry skin and even grazes or friction burns. It has been used in this way for over 5000 years, by numerous cultures and civilizations including the Egyptians, the Mesopotamians, the Chinese, Native Americans and the Ancient Greeks. The Knights of the Templar used it in a drink called ‘Elixir of Jerusalem’ which they believed increased their longevity and general wellbeing. Although there is no hard evidence to prove Aloe has these effects on humans, in tests on animals it has been found that Aloe does have regenerative properties, helping heal skin problems in rabbits and eye defects in pigs. It was also found to produce a resistance to strychnine poisoning in white mice. Of course, this proves little for the benefits of Aloe on human physiology, but as anecdotal evidence, 5000 years of use says a great deal. Aloe has been used to slow the growth of cancerous cells and has even been considered as part of a course of treatments for AIDs patients. The main benefit of Aloe that has been scientifically proven is in the treatment of gastric ulcers and ulcerative colitis. In tests, those who drank aloe vera gel in water twice a day for four weeks had a clinical response including remission of the condition. I know many people who swear by aloe juice for calming the stomach, especially in cases of IBS. Again, the evidence for this is anecdotal so please use your own judgement and consult a doctor before using Aloe for medical purposes. As well as the other numerous medical uses we have touched upon (and there are loads more!) a recent clinical study suggests that Aloe Vera may hold some hope for those suffering with diabetes. In preliminary reports it was found that ingestion of the plant may be effective in reducing blood glucose levels. Aloe has also been used as a treatment in radiation burns since the 1930s, including use on the victims of Hiroshima and Nagasaki. Cunningham tells us that having an Aloe in the house helps prevent household accidents. Thinking about how often I cut or burn myself in the kitchen, I can’t vouch for this, only that it certainly helps to have the plant around when you do have an accident! Cunningham also tells us that in various cultures the plant is said to dispel or drive away evil, and to bring good luck and protection upon the household. Aloe is associated with water; no surprise considering the way the leaves store the element in huge quantities. Despite the piercing, almost phallic nature of the leaves, the plant is considered to have a feminine aspect, and the planetary correspondence is the Moon. You can use this knowledge to apply the plant in your own magical workings. If you are doing a series of meditations based on the phases of the moon, perhaps move an Aloe plant into your sacred space, to aid your focus on the lunar cycle. An Aloe at the western corner of your altar may emphasise the element of water there. 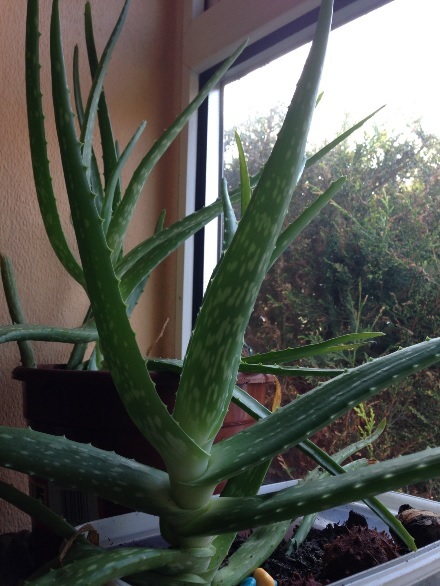 If you are allowed, place an aloe plant on your desk at work (or where you work at home). The plant will not only cheer the working area immeasurably but will bring good luck and fortune in your work. Ancient Egyptians used the plant in place of papyrus sometimes to make scrolls. Combine this knowledge with the other properties and use a mark or word carved into a leaf to emphasise your spell or working. Bury or burn the leaf, or offer it to your preferred deity. Aloe is also associated with death and funerals (courtesy, again, of the Ancient Egyptians) so an Aloe plant is an appropriate gift for someone who is grieving the loss of a loved one. A spell to heal another: Preferably at the full moon, or when the moon is visible, snap one of the leaves of your plant so you have a good size piece of Aloe. Sit outside and hold the leaf. Feel the smooth, outer skin, which holds the plant together. Feel the spikes, which protect it from harm. Feel the stickiness of the bitter gel that heals so many things. Concentrate on the healing power of the plant, and think of the one you wish to be healed. Touch the sticky gel at the broken end of your leaf. Make sure some of the gel transfers onto the first two fingers of your dominant hand. Touch those two fingers to your heart; think of the love you have for this person/animal. Touch your lips (external only! ); think of the breath that flows through these lips, keeping you alive and well, connecting you to the world and therefore to the universe and all its energies. Concentrate on your breathing for a moment. Finally, touch the two, gel marked fingers to your forehead, concentrating on sending the healing energy of the Aloe and your love and breath to the one who needs it. Rest, and meditate on your intent. Keep the piece of Aloe on your altar or in a sacred place until a full cycle of the moon has passed, then bury it, if possible in the soil of the original plant. In Jamaica, the plant is known as ‘single bible’ and is revered as a healer because of its ability to heal itself. It is often the first port of call for a child with intestinal worms. This may be because it can cause vomiting and diarrhoea. As such, don’t take if pregnant or breast feeding! Until next time.